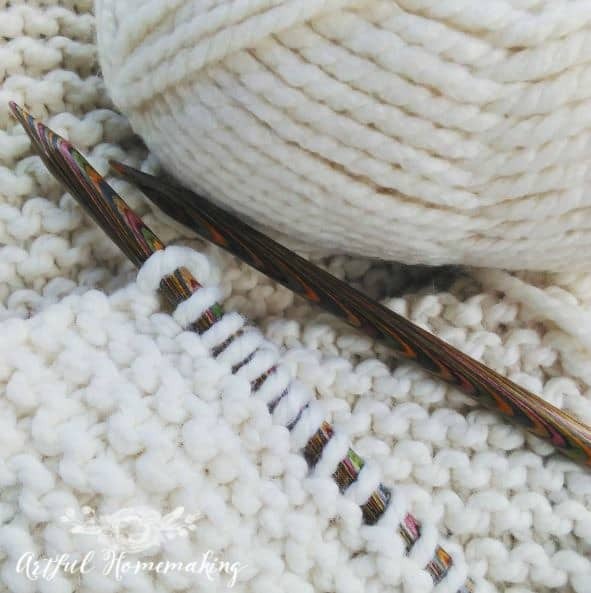 It must be the fact that fall is coming…whatever it is, I’ve been in a knitting and sewing mood lately! I’m almost finished with the cowl that I started back in January. I made good progress on it during our 17-hour trip to Florida this summer. I also have plans to finish up some sewing projects this weekend. I made a batch of whole wheat peanut butter cookies (trying to use up some of our surplus peanut butter) and also this birthday cake for my youngest, who turned seven last week. 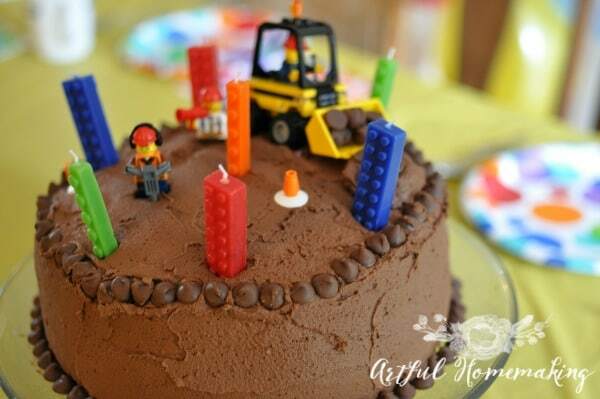 I found the Lego brick candles at the discount grocery store for 79 cents a couple years ago and hadn’t used them yet. 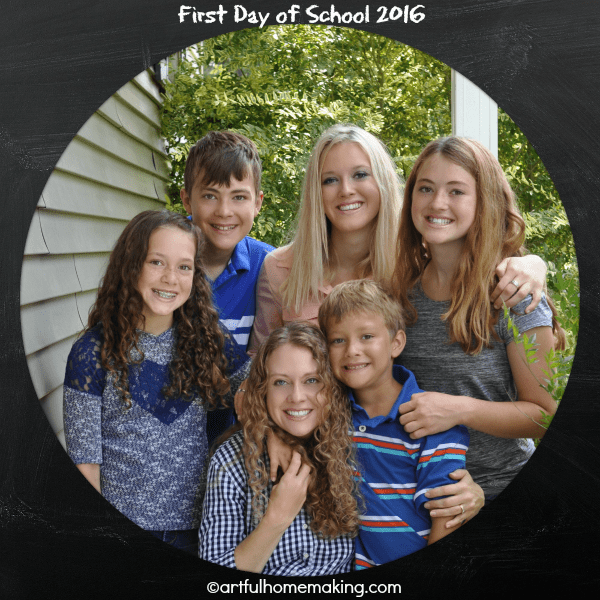 So far our homeschool year is going fabulously! I’m actually surprised at how much I’m loving it! I expected to be completely overwhelmed with Tapestry of Grace, but instead, it has been going really well. I think it may be due to all the prep work I did this summer (and using this planner). Although I’m finding out that I could have done even more to be prepared, I’m still thankful for the thought I gave to our school year in advance. I’m so happy with the way all of our morning time subjects are going (nature study, geography, poetry, etc.). This is something I’m planning to do weekly, and I love it so much. 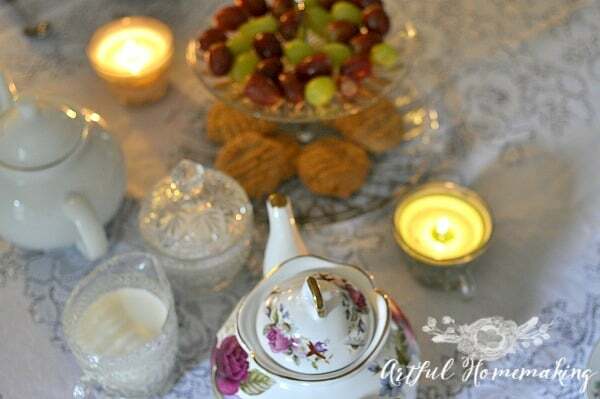 While they were busy working on other projects, I set the table with a lace tablecloth, made two pots of tea, set out some grapes and homemade peanut butter cookies, and lit candles. And then I invited them to join me for a special tea party. Everyone enjoyed this so much! It was such a treat on an overcast afternoon. I’m really excited about this new line of essential oils that are just for kids (adults can use them too!). 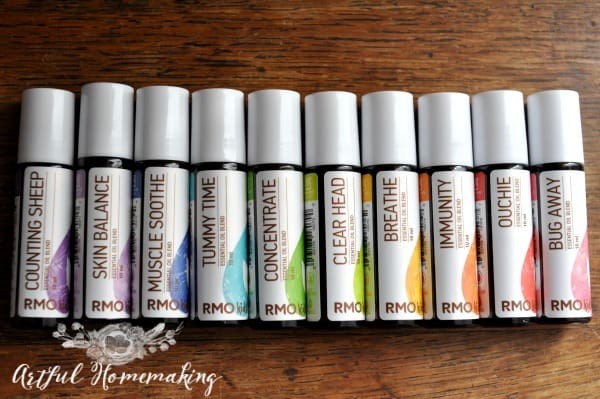 Rocky Mountain Oils has just come out with their RMO Kids Line, which is formulated especially for kids. The great thing about these blends is that they come pre-diluted for easy on-the-go application wherever you are! As a mom who uses essential oils with my five children, I really appreciate the ease of use built into these blends. And right now you can create your own kit and get 1 free when you buy 3! Next week is going to be busy for us since we’re starting piano lessons and gymnastics! Those outside commitments will change the way I’ve been doing things, but hopefully we can adjust and still get everything done that we need to. I’m thinking of taking up freezer cooking again to help with meals on those away-from-home days. How has your week been? What have you been loving lately? Note: This post contains affiliate links. Read my disclosure policy here. Sharing here. Thank you for your Blog! Such sweet blessings and encouragement! Have a blessed week even in the rushing!! Heather, thank you so much for your kind words about my blog. Just the encouragement I needed today. I hope your week is blessed also! I like number 2 cooking from the pantry. You have a beautiful family. Thank you, Betty! I’m so glad you stopped by today! I like September : it’s a quite month to reorganize my routine and my goals as a homemaker . I show these lilac cratfs on my web site. Your First Day of School picture is the sweetest start , I think ! I love your thoughts on September, Franca! You’re so right—it’s a great time to reorganize homemaking routines and goals. Sounds like great things!! I need to clean out my pantry too. Great idea!! I love the picture of you and your kids. Thanks, Nancy! Eating from the pantry has been fun. Now we’re reaching a point where we need some basics to supplement what’s left. Hope you have a great weekend! 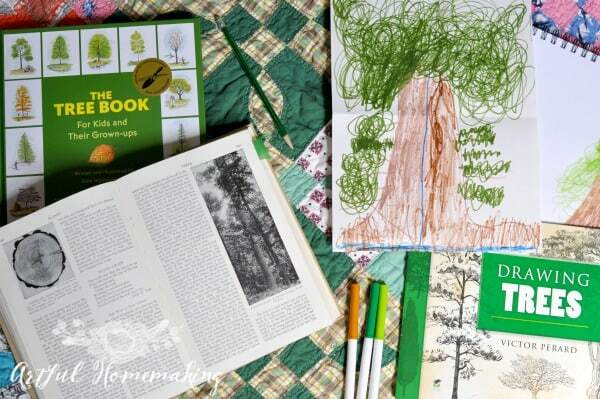 Such a lovely “first-day-of-school” picture – and I really like your tea party idea!! Hope y’all have a great weekend! Thank you, Tracey! Even my boys enjoy the tea parties (because food is involved!). 🙂 Hope you also have a great weekend!